Compumedics Neuroscan is dedi­cated to expand­ing knowl­edge and under­stand­ing of the human brain and nervous system through advanced technology. They are a lead­ing provider of tech­nolo­gies for high-density EEG record­ings and electro-magnetic source local­iza­tion. Integrating Neuroscan EEG hardware with EyeLink systems is very straightforward. 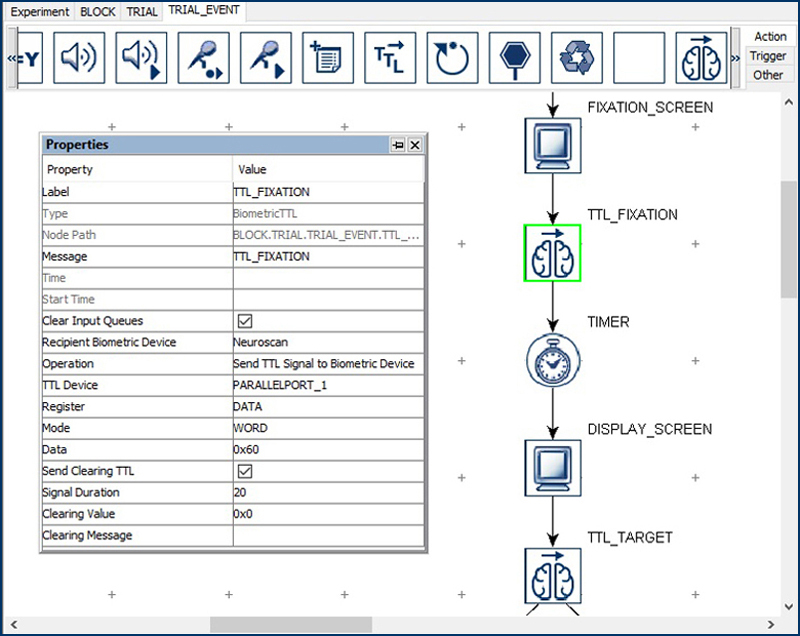 Integration is achieved via standard TTL signaling, typically via a parallel port on the Display PC (although the parallel port of the EyeLink Host PC can also be used). The only other component required is a Trigger Cable (supplied by Neuroscan). 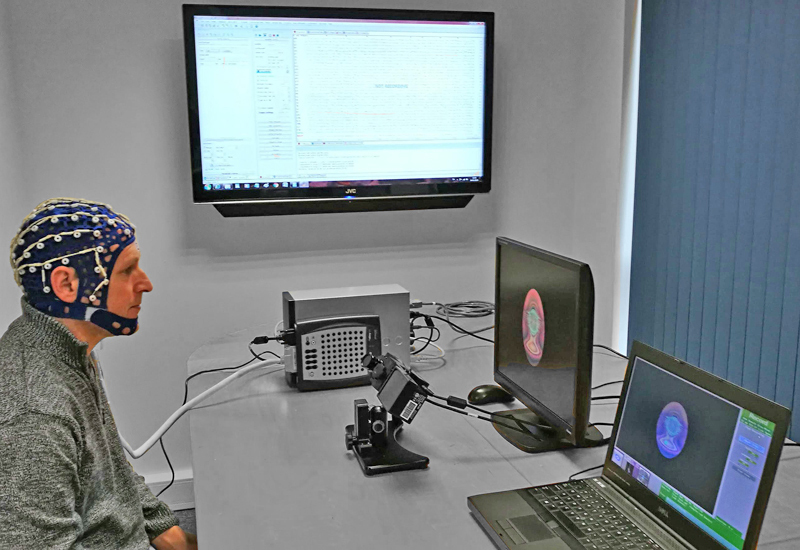 Version 2.2 of SR Research Experiment Builder software has dedicated nodes that simplify integrating Neuroscan EEG systems with EyeLink systems. During task performance, the stimulus presentation software (e.g., Experiment Builder, E-Prime, Presentation, PsychToolBox, etc.) 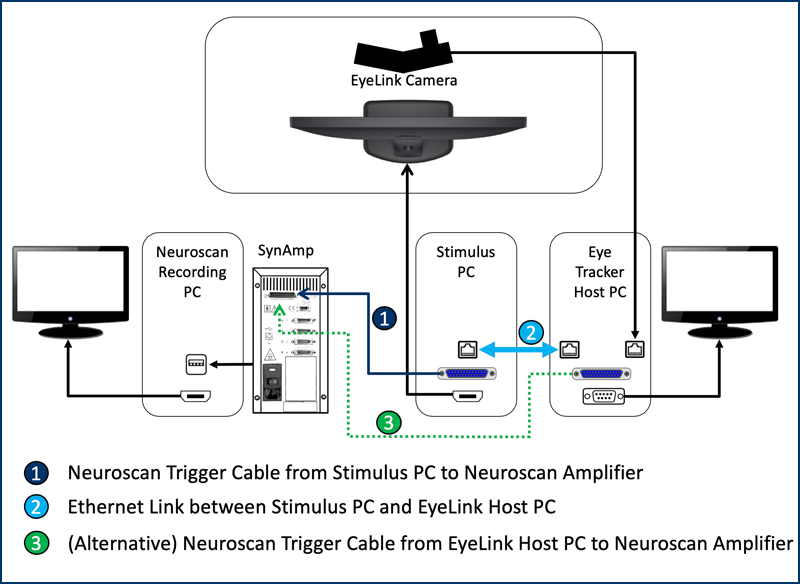 simultaneously sends TTLs signals to the NeuroScan equipment via a parallel port cable, and messages to the EyeLink Host PC via an ethernet link. The TTLs / Messages mark key trial events (such as stimulus onset / participant response etc), allowing the two data streams to be synchronized at the analysis stage. If neither the Display PC or Host PC has a parallel port, then a device such as the USB2TTL8 can be used.